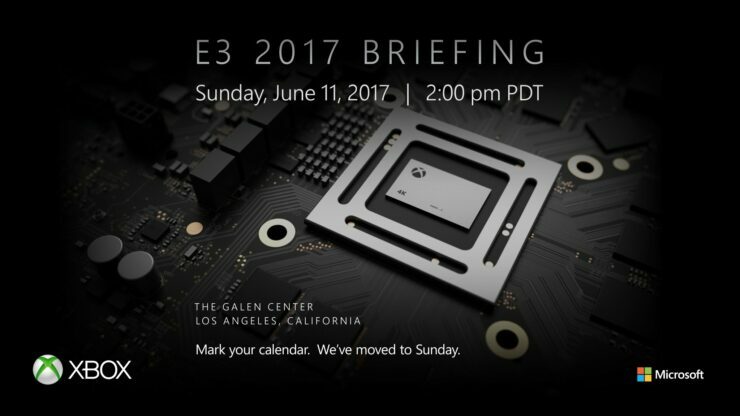 The date and time for Microsoft’s Xbox E3 2017 press conference has just been announced through Twitter. Microsoft has decided to move its conference to Sunday instead of the Monday. At the moment of writing, the reasoning behind this decision is unknown. As said, Microsoft usually held its briefings on Monday mornings. During the conference, Microsoft will likely provide more details about the upcoming Xbox Scorpio, which is slated for a release later this year. Microsoft officially announced ‘Project Scorpio’ during its E3 press conference last year. The next step-change for gamers and developers must deliver true 4K gaming and high-fidelity VR experiences to the console. To that end, we were happy to announce the next addition to the Xbox One family: Project Scorpio. When it ships next year, Project Scorpio will be our most powerful console ever built, specifically to lead the industry into a future in which true 4K gaming and high-fidelity VR are the standard, not an exception. Project Scorpio will be the first console with 6 teraflops of power, which will empower the world’s greatest game creators to fully embrace true 4K gaming without sacrificing quality, generate premier VR experiences, without sacrificing performance, and putting greater graphic fidelity in the hands of the world’s best game creators. Best of all, Xbox One, Xbox One S and Project Scorpio will all be compatible. All Xbox One games and accessories will play on each device. It’s very important to us that no one gets left behind, which is a big part of why we view Project Scorpio as a new way of thinking about consoles and generations. E3 2017 is scheduled to take place from June 13 through June 15, 2017, at the Los Angeles Convention Center.